STOP RIGHT HERE if you haven't read the first three books in this series and don't want any spoilers! Tricks, treats, and good eats! As the creepy little town of Nightshade prepares to celebrate its two hundredth anniversary - on Halloween, of course - many of its paranormal residents are receiving mysterious blackmail letters. Psychic teen Daisy Giordano and her sisters set out to find who is behind the threats. But launching an investigation isn't easy for Daisy with her overprotective father watching her every move. Though she's happy to have him back after the years he spent being held captive by an anti-paranormal group called the Scourge, Dad is having a difficult time adjusting to home life - and the fact that his little girl is now a senior in high school. He even disapproves of Daisy's boyfriend. Ryan, meanwhile, to Daisy's dismay, has been considering some faraway colleges thanks to the advice of Nightshade High's new guidance counselor. Can their relationship take the strain? It's Daisy's senior year, and, on the surface, things couldn't be looking better. She's got a great boyfriend, Ryan, and her dad is finally back home after being held captive by the Scourge for the last six years. But it turns out that life can't just go back to normal. Daisy's dad still thinks of her as the twelve-year-old she was when he was taken, and he treats her like it too. She has a curfew now, and dear old Dad doesn't like it when she spends time with her boyfriend or does anything else to remind him that she's not such a little girl anymore. Ryan and some of the other paranormals in town start receiving blackmail notes. Nightshade High has a new guidance counselor, Ms. Tray, who seems to have a grudge against Daisy. And on top of it all, Daisy won cooking lessons with the world's most temperamental chef, Circe Silvertongue. Can Daisy solve the blackmail mystery in time with all of the other drama in her life? I love this series. It's adorable! If you haven't already, I highly recommend picking up the first three books for some quick, clean, easy reading. The characters are all well-developed, mystery abounds, and Perez is not afraid to toss in twists and turns when you least expect them. There are more storylines going on in this book, which at this point is a nice change of pace. I hope she keeps that up in the next installment. If you haven't already, make sure to check out the first three books in this series: Dead is the New Black, Dead is a State of Mind, and Dead is So Last Year. 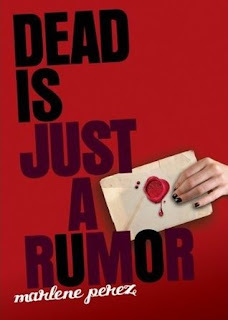 The fifth book, Dead is Not an Option, will be released in spring 2011.